The exclusive Shun Gold series captivates with its brilliant details and elegance. The characteristic feature of these beautiful chef’s knives is the golden ring that stylishly enhances the Japanese aesthetics of the blackish-brown Pakka wood handle. Additionally the end of the handle features a stamped logo. Another new and distinctive feature in comparison to the Classic Shun series is the symmetric handle geometry that guarantees both left- and right-handers equal cutting comfort and precision. The well-known quality and sharpness of the renowned Shun Classic series of course also applies to the Shun Gold series. The individual grain of the Damascus blade and numerous manufacturing steps by hand like grinding the blade make each knife a unique piece. 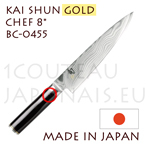 Shun professional chef’s knives are made from a newly developed stainless damask steel with 32 layers. The inner layer is made from V-gold-10 steel. This steel is highly resistant to corrosion, extremely hard (61±1 HRC, 1.0% Carbon, 1.5% Cobalt, Chromium, Manganese, Molybdenum, Silicon and Vanadium) and the reason for the blade being incomparably and lastingly sharp. The Tokyo-based KAI Group has for more than 90 years manufactured cutlery and related products of exceptional function, sharpness and durability. 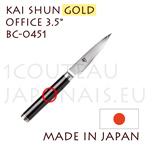 It’s these qualities that presently place japanese knives by KAI among the world’s best. The common denominator of quality and perfection is based on the ancient culture and tradition of Japanese Samurai sword forging. The KAI Group is present over the world with more than 10.000 different items related to cutting. Welcome to the Japanese Kitchen !